I get a lot of emails these days. I get emails from friends and family, invitations, blog suggestions, and the occasional spam. I also get emails that advise me of upcoming events that might interest me, and one of these arrived in my inbox recently. It was an email from MacDonald Island advising that Rex Murphy of CBC is coming to Fort Mac - and doing an episode of "Cross Country Checkup" from right here. If you aren't familiar with Cross Country Checkup, it is a long running CBC radio show. And by long running I mean since 1965 (yay, finally something older than me!). The entire idea of the show is to take a topic, have an expert or speaker talk about it with the host - and then open it up to people from around the country who phone in with their thoughts on the issue. Call-in shows have been around for a very long time, but for those who have never heard one it's like the old school version of an online chat room or forum. And like those chat rooms and forums it can be a fascinating glimpse into the thoughts of other people, from the very profound to the deeply puzzling. I've been listening to Cross Country Checkup for years. And a lot of that listening was done in my car, as for the last 15 years or so we have lived in places where we travelled by car a fair bit. Prior to Fort Mac we lived in Red Lake, Ontario (and the next time you think we are remote here get out a map and look up Red Lake - see where the highway ends in Northwestern Ontario past Kenora? Yes, I lived, quite literally, at the end of that highway in a tiny little town called Cochenour). We spent many hours driving back and forth to Dryden and Kenora, and here we have spent a similar amount of time on the road to and from Edmonton - and much of this travel coincided with times when Cross Country Checkup happened to be on the air. The topics have often been fascinating, and sometimes controversial. As the show progressed my husband and I would listen, and it would often lead to us discussing those topics, too (and a few fights, I admit - we are both pretty opinionated and stubborn, so we can have some spectacular car trips). I guess I have a history with this radio show, and, well, my voice has even been heard on it a couple of times when I called in about something that caught my interest (opinionated, stubborn, AND vocal - it's a helluva combination, people, just ask that long-suffering spouse of mine). So, when I got the email announcing Cross Country Checkup was coming here - and with Rex Murphy, no less, someone who I think is pretty astute in many matters - I was delighted. And I was even more pleased when I learned his guest would be our lovely mayor Melissa Blake, as I cannot imagine a better representative for our community than Melissa. What are they going to be discussing? They are going to be discussing us, people. The oil sands, and the community. They are going to be talking about the topic which has become near and dear to my heart - this place I call home. And it gets even better, I think. This time I won't have to turn on my radio - because I'm going to MacDonald Island on Sunday to watch the show. I plan to be there early to secure a spot, and one of the Intrepid Junior Bloggers wants to come, too (the younger one - she is a CBC junkie, and listens to it every morning when she wakes up). 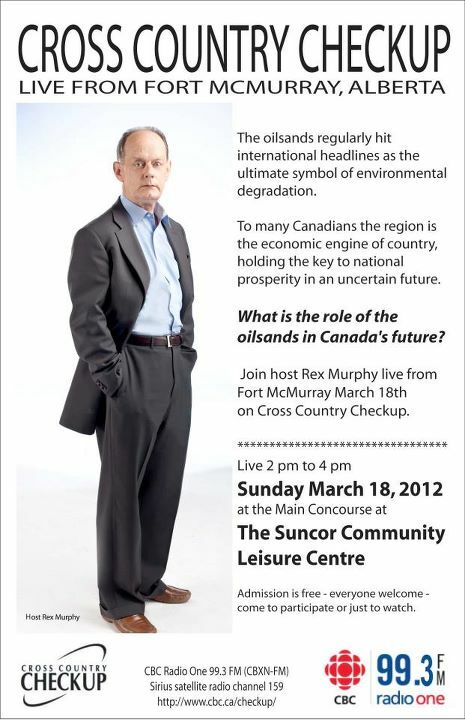 I'll get to see Rex Murphy, the person behind that iconic voice, and I'll get to see him speak to Melissa Blake about us. One of my favourite radio personalities, with one of my favourite local people, talking about one of my favourite topics (and the reason I write this blog). I'm not sure how it gets more perfect than that, people. Except that it does get better - because you can come too, Fort Mac. Everyone is invited to see this bit of history happen, and I hope you'll take advantage of it. This is a chance to show CBC Radio who we are - to tell them our story of life here, not the story they have read from outside journalists or heard from those who have never even seen this place. This is yet another opportunity to show the world who we are, and to share a bit about ourselves with the rest of the country - and beyond, as Cross Country Checkup reaches far past our national borders. So, what are you doing on Sunday, people? You know where to find me - and I'm hoping to find you there, too. I'll be up close to the front, probably smiling like a crazy person and enjoying every last minute. The big show is coming to town - how can you possibly miss that? This show was a Fort McMurray love fest.. completely unbalanced and totally unrealistic. I like Fort McMurray, but I get suspicious when you go from one extreme to the next. No city is perfect, so why pretend it is? Everyone knows Fort Mac is nowhere near perfect even when the oilsands are not onsidered. For example, the buses don't run on time and change routes randomly, there is a disproportionately big drug problem in the city, housing/rental prices are insane, and there's very little to do outside of outdoor activities that any and every other Canadian city can make a claim to. I am sure that all the people listening thought, "Okay, well, what are these people trying to cover up and what aren't they telling us about?" I think this program did Fort Mac a big disservice. It's great people have pride in Fort Mac (I do too, believe it or not) but I also know that when you overdo it, people stop listening.. maybe that's happening to me now. ha.